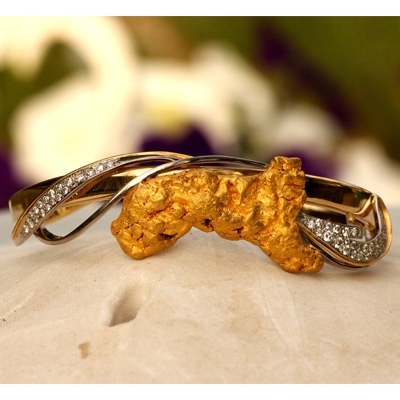 Stunning One-of-a-Kind Alaskan Gold Nugget and Diamond cuff. The Natural Alaskan gold nugget used is 16.1 grams and the total diamond weight is .62ct, the overall weight of the cuff is 43.1 grams. This is a one of a kind custom piece that has been signed by the artist. This custom cuff has sold. Give us a call to see our nugget selections to make your very own personalized custom cuff.